A team of construction workers and their apprentices from Robert Woodhead Ltd got a special visit from some very creative children this Easter. The Woodhead team working on Derbyshire’s New Bolsover Model Village thoroughly enjoyed a visit by a group of children from the local primary school just before their Easter break. 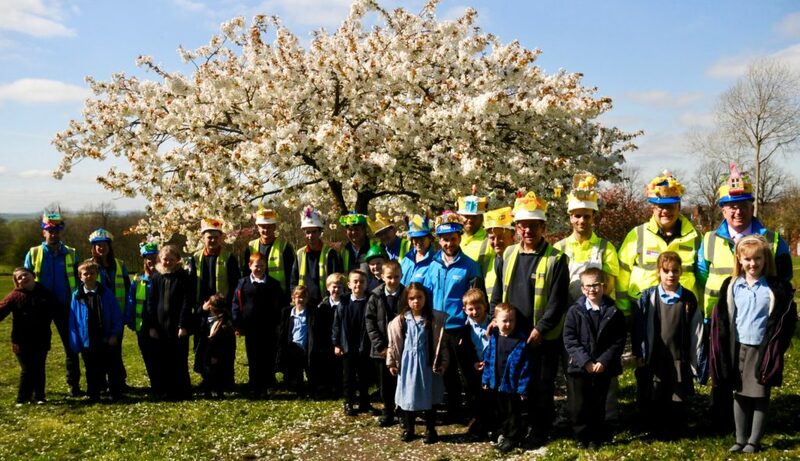 The team’s Project Manager, had been in touch with New Bolsover Primary School and asked if some of the children would like to design them some Easter bonnets to wear over their hard hats to brighten up their Easter. All of the children at the school took up the challenge and produced some ‘egg-cellent’ Easter bonnets. Two children from each class were chosen to present their bonnets to the builders for them to show off on site while they worked. Each child delivered their individual design to the site with their teacher, Elizabeth Mulcahey, who was thrilled with how well the children had done. She said: “It was such a lovely idea and the children had a lot of fun in the classroom designing and making the bonnets for the local builders. Woodhead’s Site Manager on New Bolsover Model Village, Tony Kent, said: “We thought this would be a great way for the local children to get involved with what we are doing in their community.